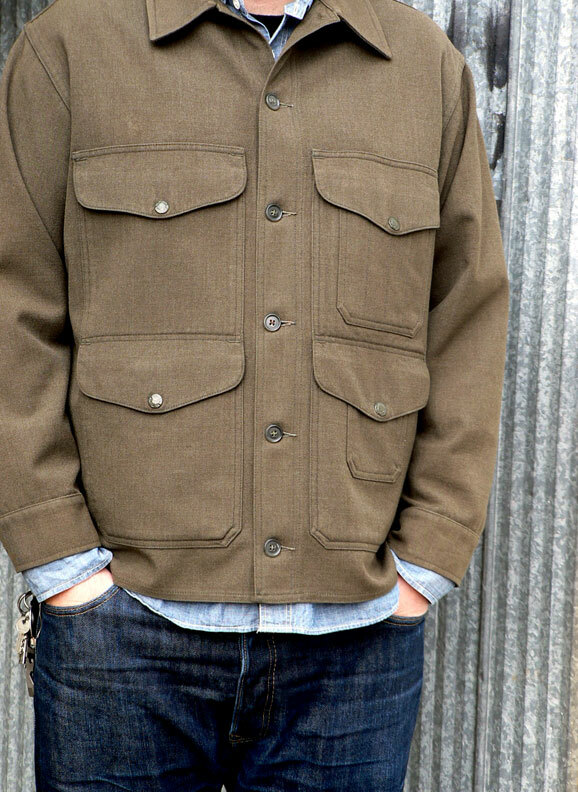 Editor’s note: A month ago, Chris Adamiak, Damn-Yak Dry Goods proprietor, emailed me about a vintage Filson cruiser he spotted on Etsy. 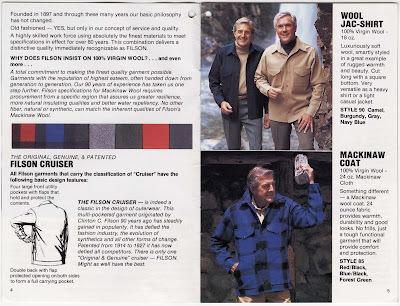 He asked for my help in identifying the fabric which is lighter weight than the 24 oz. 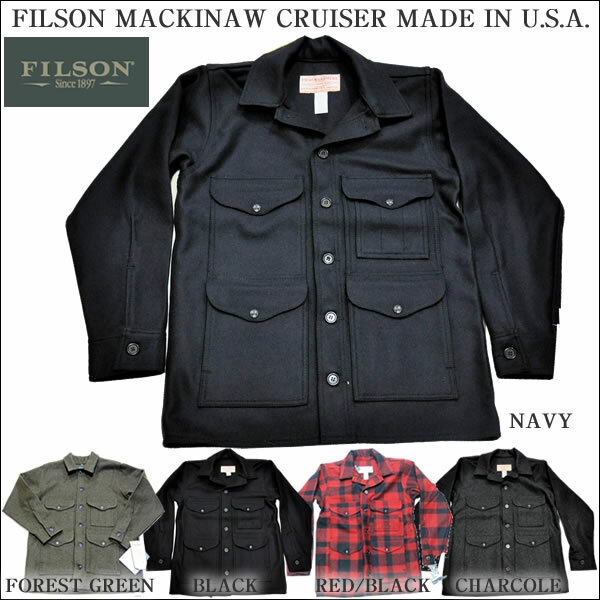 melton wool used for current model Filson cruisers. 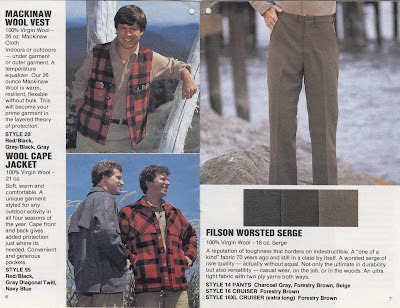 I forwarded along some Filson catalog scans speculating that the fabric in question was a discontinued worsted wool serge. 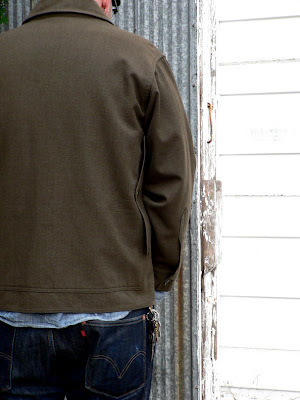 Chris purchased the Cruiser and, at my request, wrote up a review for Archival. 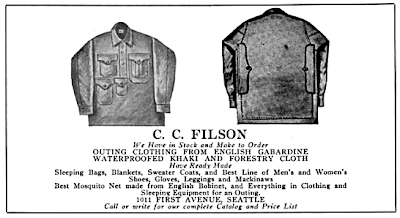 In Canada, Filson doesn’t have the availability as it does in the States. 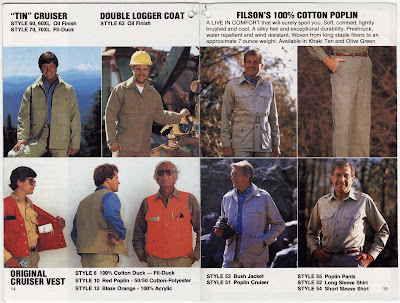 The distributors are few and far, and when we order online we face massive shipping, duty, and custom fees (due to the weight of Filson’s heavy fabric). 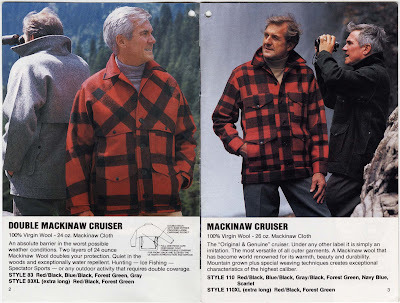 It makes me so upset reading tales in forums of people finding Tin Cloth Cruisers in Thrift stores for $5. 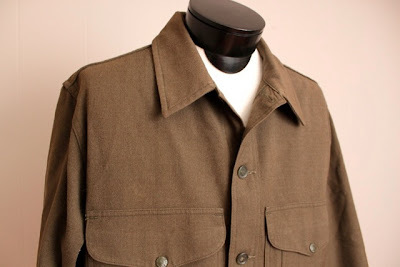 Finding Filson anything, in any store here is a miracle and being 6’5″ makes the search even harder for vintage items. 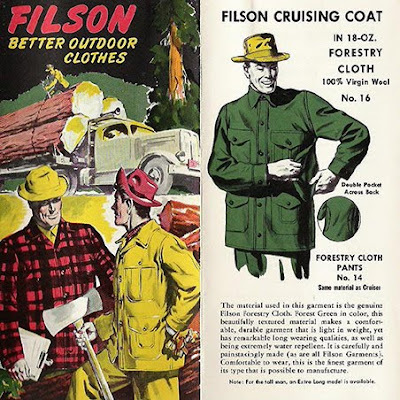 I have spent countless hours scouring Etsy, Ebay, and many other vintage clothing shops online for decently priced Filson that I can actually wear. Two weeks ago I stumbled upon this late 50’s to mid 60’s green wool cruiser for $50. 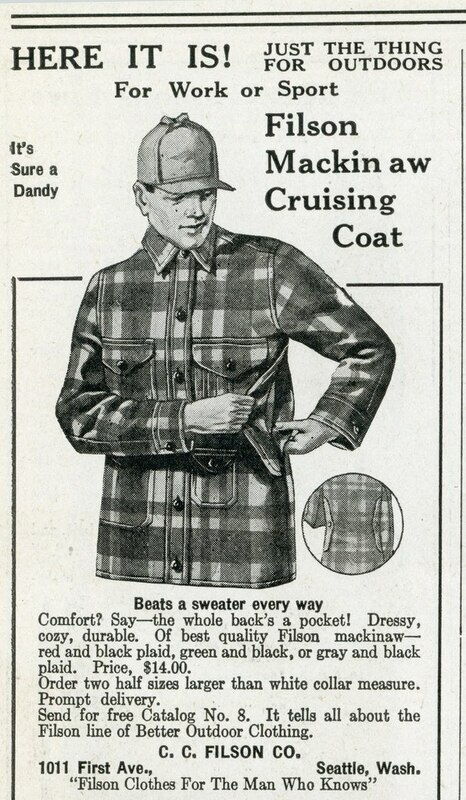 The measurements seem to match my Pointer brand chore coat I wear daily. So without hesitation I scooped it up. After my purchase I contacted Lesli, in regard to its fabric, because in the picture on the listing it seemed very light. 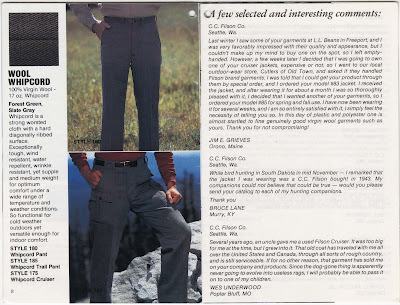 With a quick reply she sent me a link to a old catalog page (see below) suggesting that it might be worsted serge. 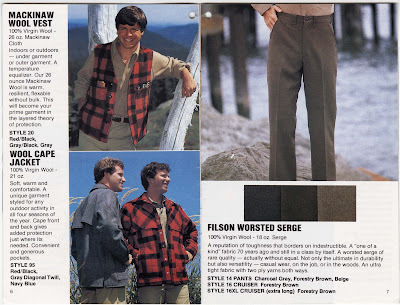 However, on that same catalog picture there is no mention of a green worsted serge, only grey, brown, or beige. 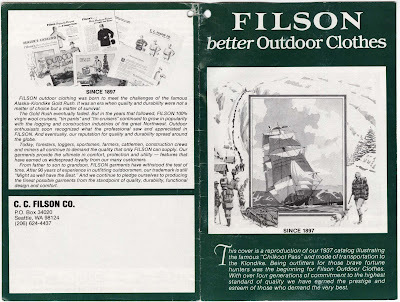 Then I saw the display tag from AC’s Flickr page for a early forestry cloth cruiser. 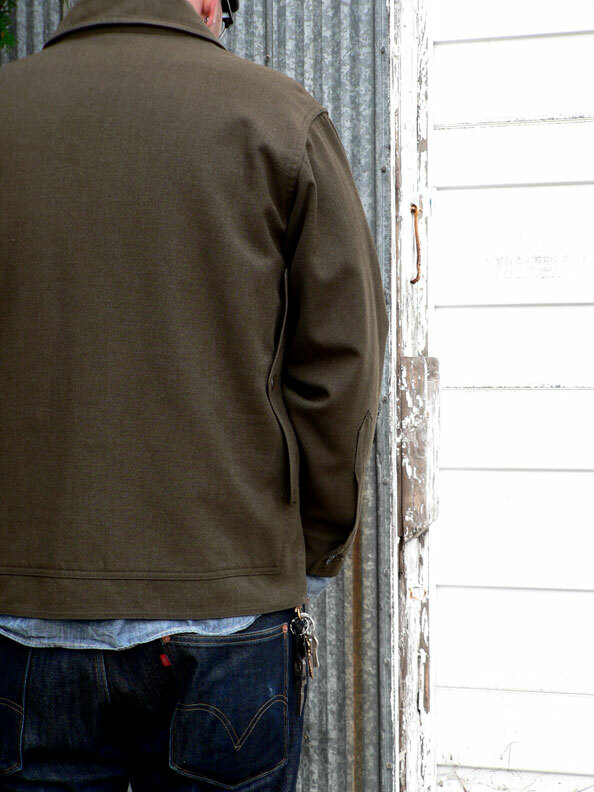 It states that forestry cloth is a green Worsted serge. 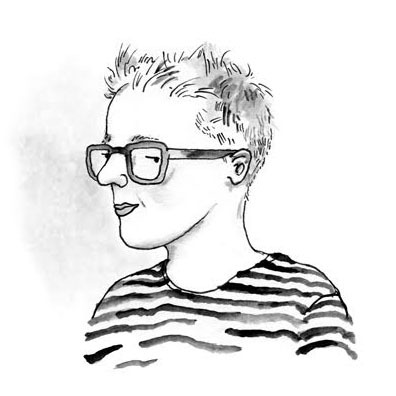 This made me even more excited. Could it be a rarer piece in my size? Last week the Etsy Cruiser arrived and taking it out of the package, I was amazed at how “new” it was. It looked like it was only worn maybe one season. 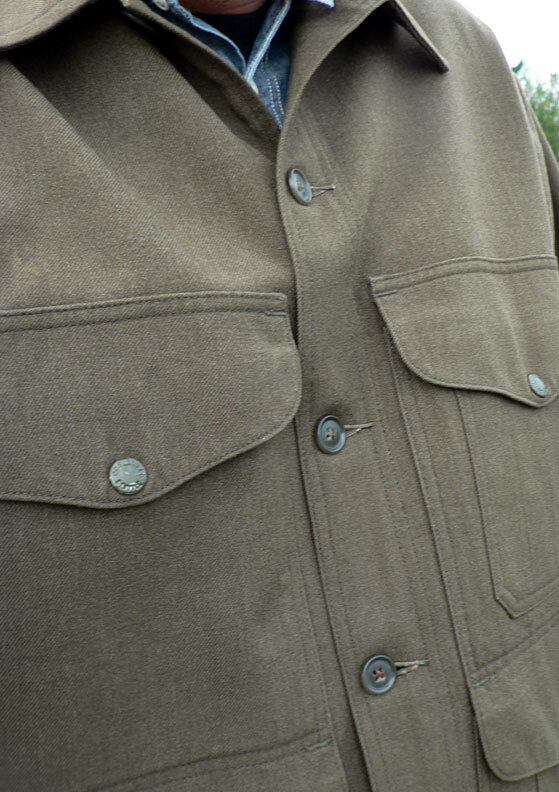 I was also surprised at the weight of the jacket. It was not light and flimsy but quite heavy and tough. 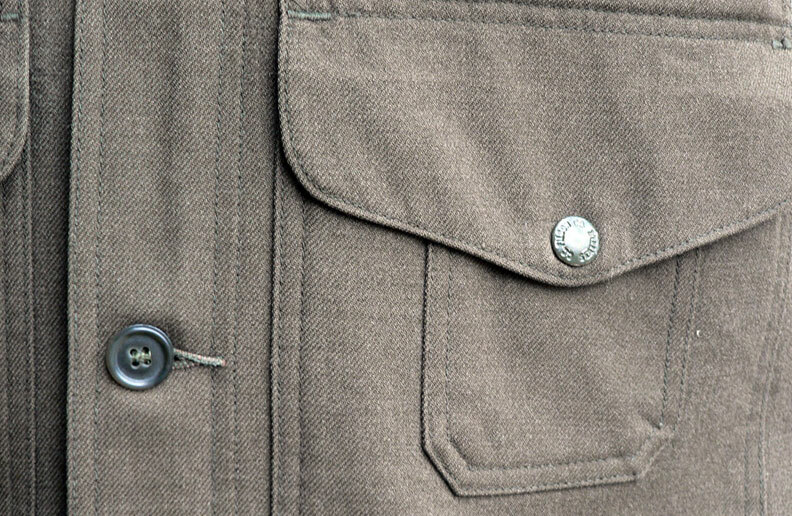 The tight, diagonal wool twill does not stretch, and has no problem blocking all the light when held up to a bulb. 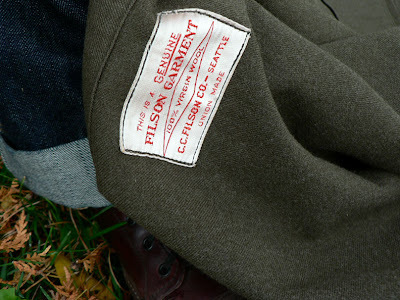 The fit is true Filson. I wear a 44 suit and this is bang on. 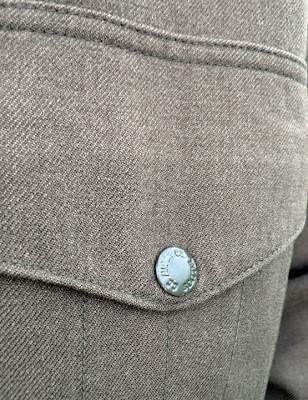 Although looking at the label there is no size tag, so I cannot be sure of its exact size. The green color is still very pure, with only tiny specks of fading. Also this past week here in Toronto it has been about 9*C (48*F) in the morning and I was surprised at how warm this cruiser is. Along with being very warm , the cruiser still provides plenty of movement and doesn’t catch and stay up on my back when reaching above my head. I have never worn a Filson Mackinaw, but I have heard that they are quite heavy and extremely warm. 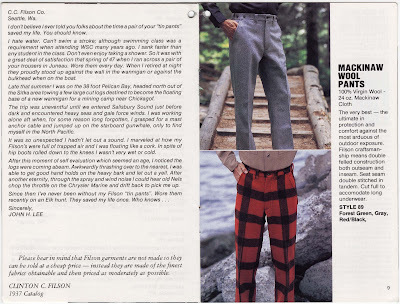 I have a early Woolrich Buffalo plaid mackinaw and you can forget being indoors for any length of time with a coat like that on! 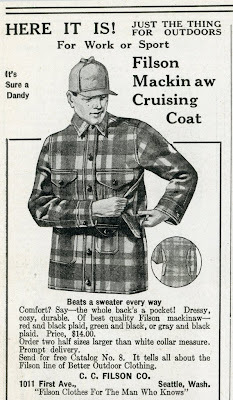 That’s where the Cruiser coat fits in perfectly. 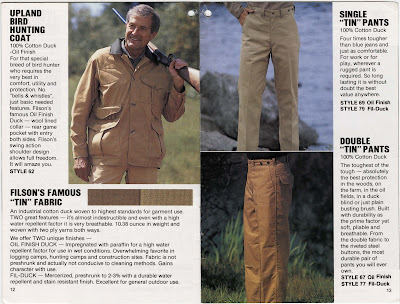 The fabric is thin enough to move from outdoors to indoors, tough enough to trek through thickets and brush, tight enough to ward off light showers and snow, and roomy enough for layering options underneath. 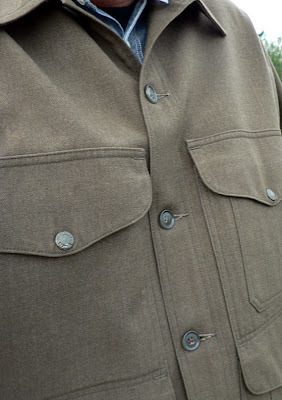 I am not exactly sure if it the jacket is made in forestry cloth or whipcord, as I have never held or seen either up close. But what I do know is that this cruiser is not a standard issue item. Why Filson eliminated this fabric as a standard cruiser option baffles me — they still make shirts out of serge and pants out of whipcord. From what I have been told, they will still make whipcord cruisers in their custom shop for a greater price. 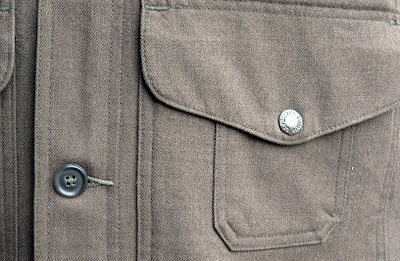 Its a great seasonal transition coat, from Summer to Fall and Winter to Spring. 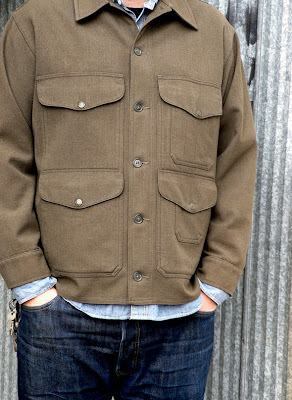 This coat will definitely be a new daily driver for me from city to forest. 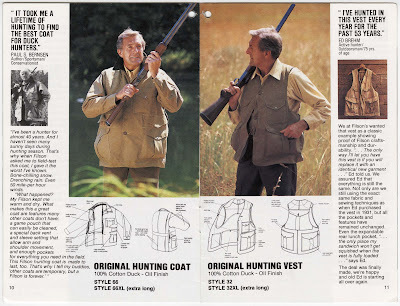 And as much as I really like this coat, the search for these kind of pieces never ever really ends! From the Archives: Filson catalog, circa 198X? From my collection of printed Filson ephemera.